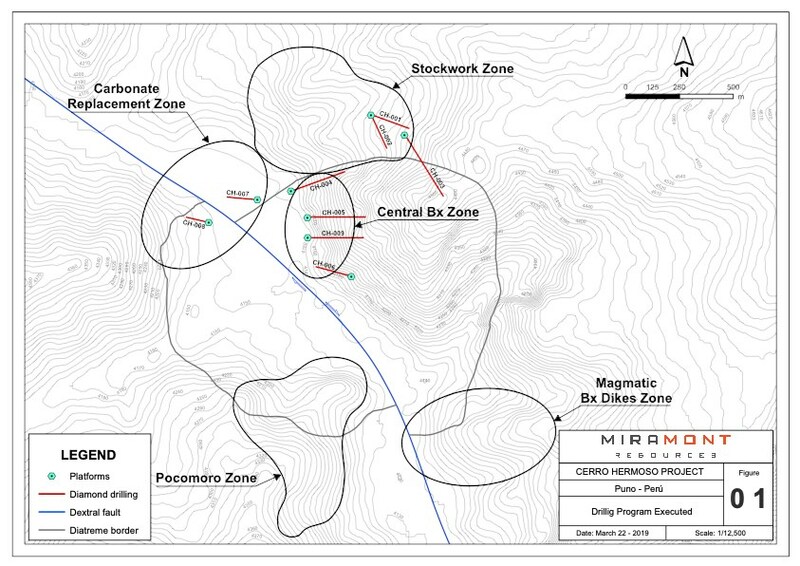 Vancouver, British Columbia--(Newsfile Corp. - April 12, 2019) - Miramont Resources Corp. (CSE: MONT) (OTCQB: MRRMF) (FSE: 6MR) ("Miramont" or the "Company") is pleased to announce it has received final assays from its 3,679-meter diamond drill program at its Cerro Hermoso polymetallic project located in southern Peru. Results include 249 m of 0.68 gpt Au equivalent including 1.95 m of 28.4 gpt Au equivalent in hole CH-009 (please refer to a table of results below and a nearby plan map showing the location of drill holes). 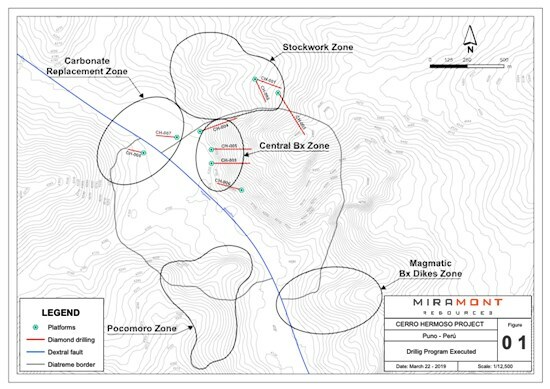 Dr. Quinton Hennigh, Miramont's Chairman said: "First pass drilling has confirmed the presence of a large mineralized system at Cerro Hermoso. Mineralization within the Central Breccia Zone appears open to the northeast, east and southeast as well as at depth. A nearby magnetic anomaly suggests the system is driven by a buried intrusion. Over the coming weeks we plan to compile, review and interpret all data from the latest program."